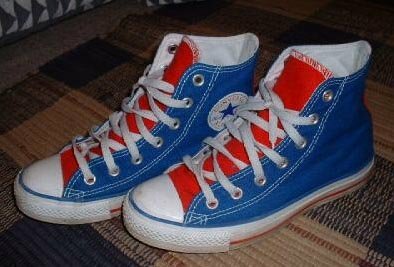 Photo gallery of 2-Tone high top and low cut chucks. 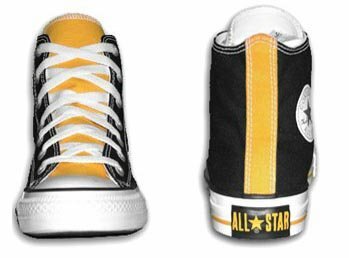 1 2-Tone Chucks Black and gold 2 tone high top, left inside view. 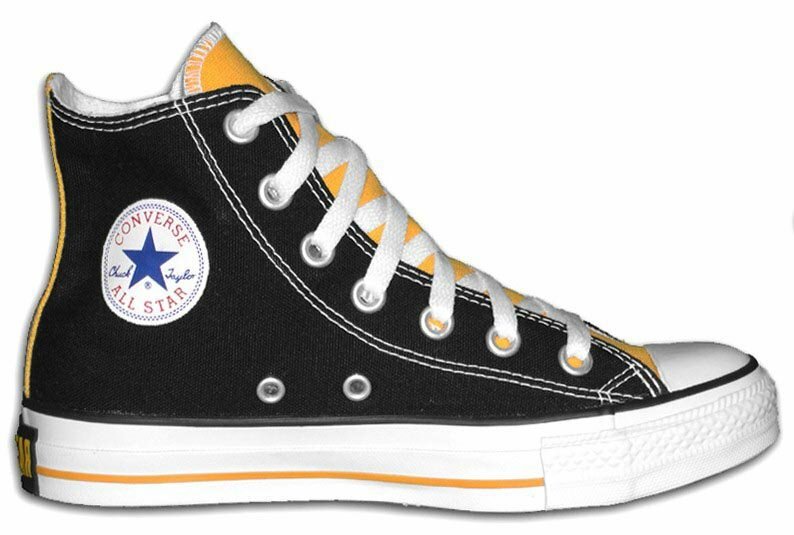 2 2-Tone Chucks Black and gold 2 tone high top, fromt and rear views. 3 2-Tone Chucks Black and pink 2-tone high top, left inside patch view. 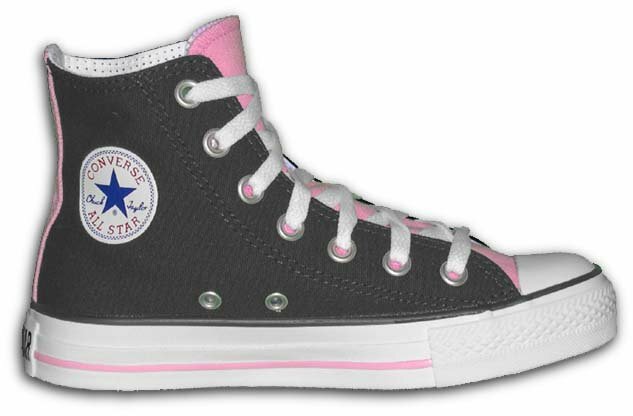 4 2-Tone Chucks Black and pink 2 tone high top, angled side view. 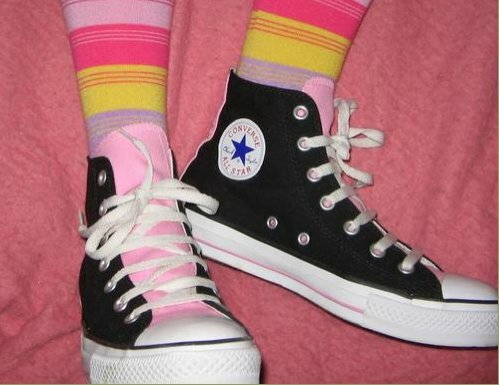 5 2-Tone Chucks Wearing black and pink 2-tone high tops, angled side view. 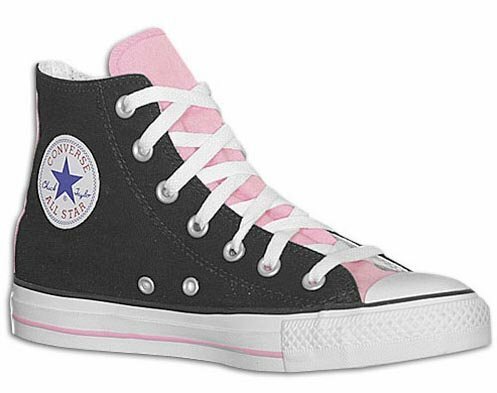 6 2-Tone Chucks Black and pink 2 tone low cut, right outside view. 7 2-Tone Chucks Black and white 2 tone high top, top view. 8 2-Tone Chucks Black and white 2 tone high top, left inside view. 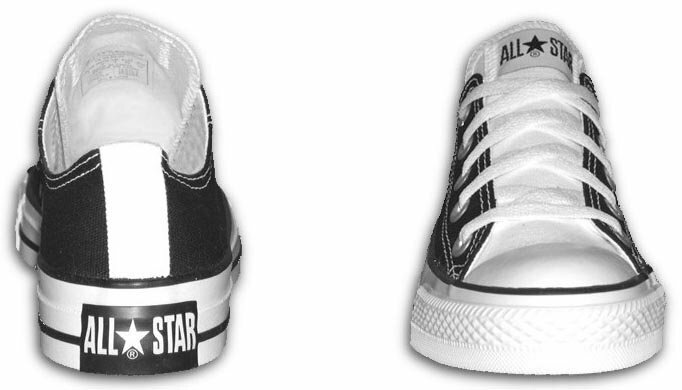 9 2-Tone Chucks Black and white 2 tone high top, outsole view. 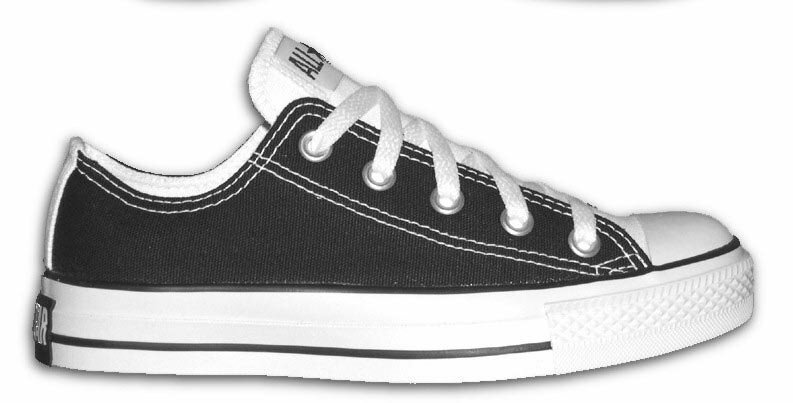 10 2-Tone Chucks Black and white 2 tone low cut, right outside view. 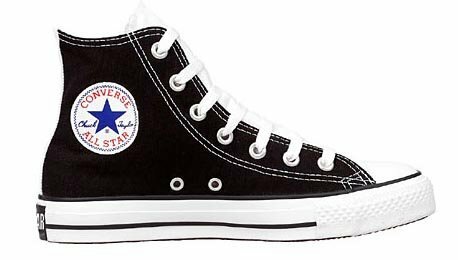 11 2-Tone Chucks Black and white 2 tone low cut, rear heel and front views. 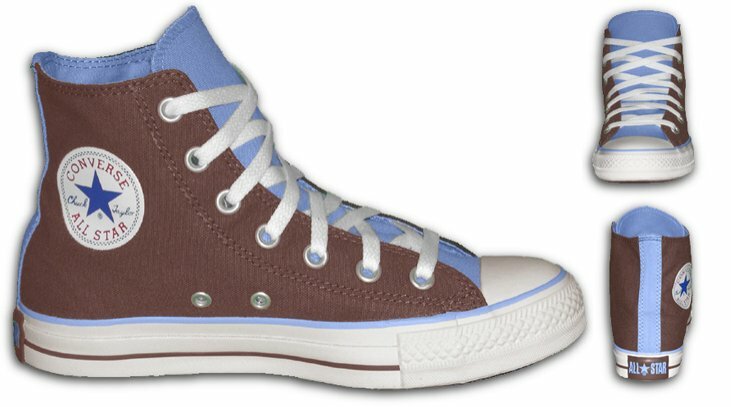 12 2-Tone Chucks Brown and light blue 2-tone high top, catalog view showing left inside patch, front, and rear views. 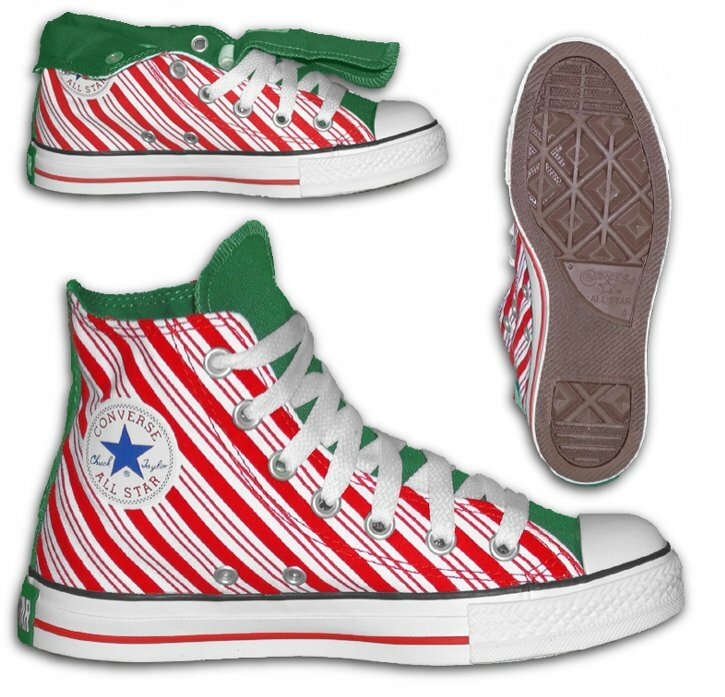 13 2-Tone Chucks Candy cane stripe and green 2-tone foldover high top chucks, side and sole views. 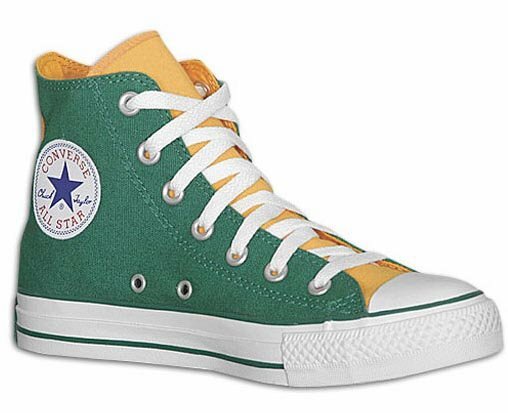 14 2-Tone Chucks Green and gold 2 tone high top, left inside patch, front, and rear heel patch views. 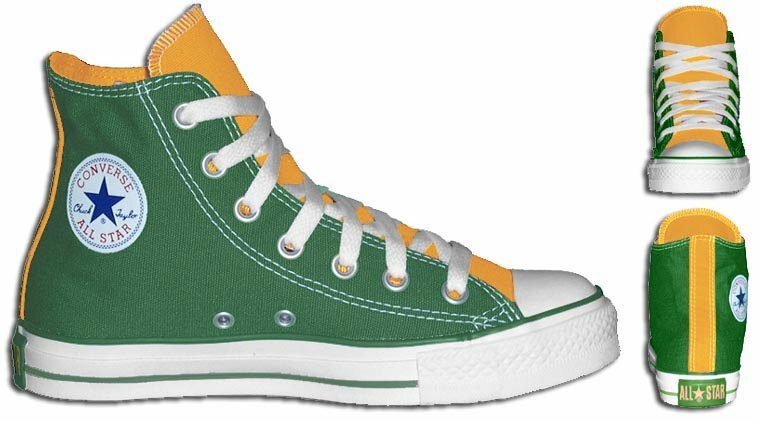 15 2-Tone Chucks Green and gold 2 tone high top, angled inside patch view. 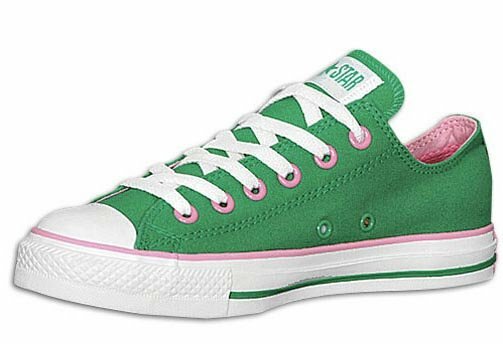 16 2-Tone Chucks Green and pink 2 tone low cut, angled side view. 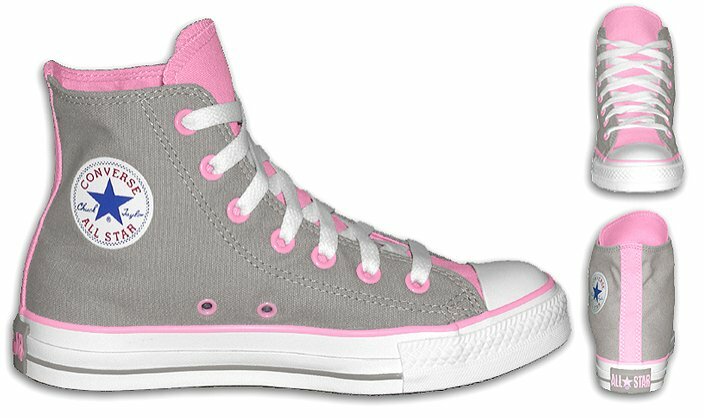 17 2-Tone Chucks New grey and pink 2 tone high top, catalog view showing left inside patch, front, and rear views. 18 2-Tone Chucks Jay from the band Club 8 wearing purple and gold 2-tone chucks. 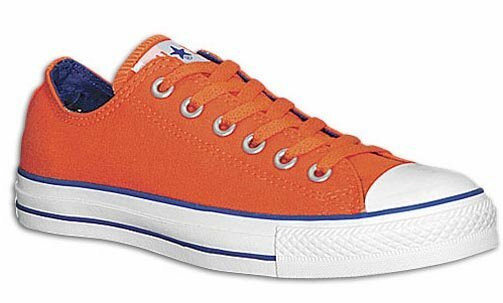 19 2-Tone Chucks Orange and navy blue low cut, angled side view. 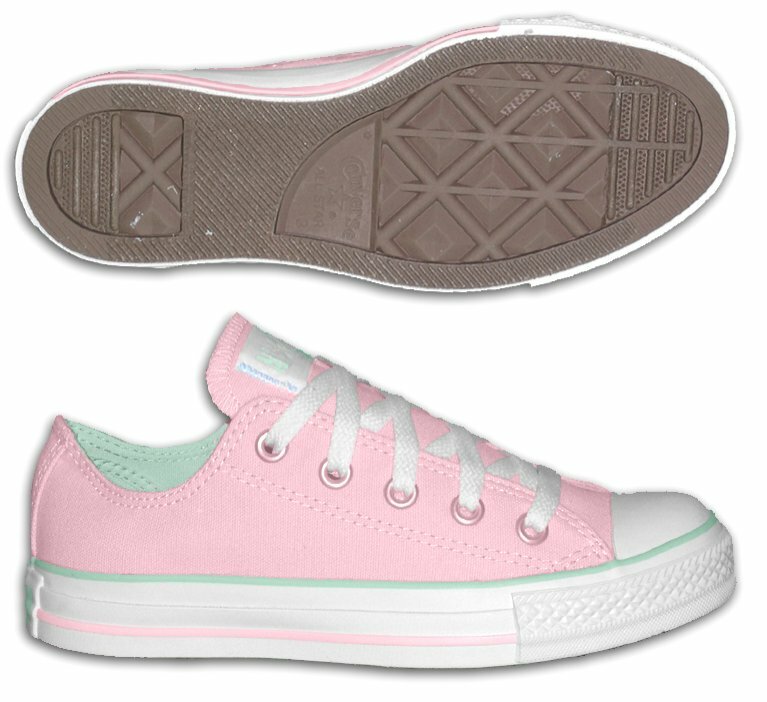 20 2-Tone Chucks Pink and green low cut chucks, side and sole views. 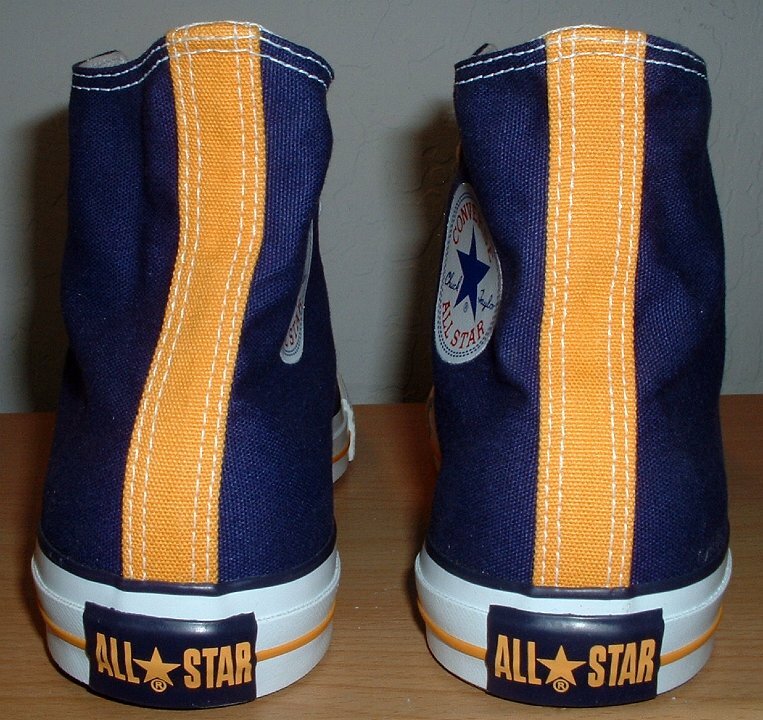 21 2-Tone Chucks New purple and gold 2 tone high top, right inside patch view. 22 2-Tone Chucks New purple and gold 2-tone high top, outside right view. 23 2-Tone Chucks New purple and gold 2-tone high top, left inside patch view. 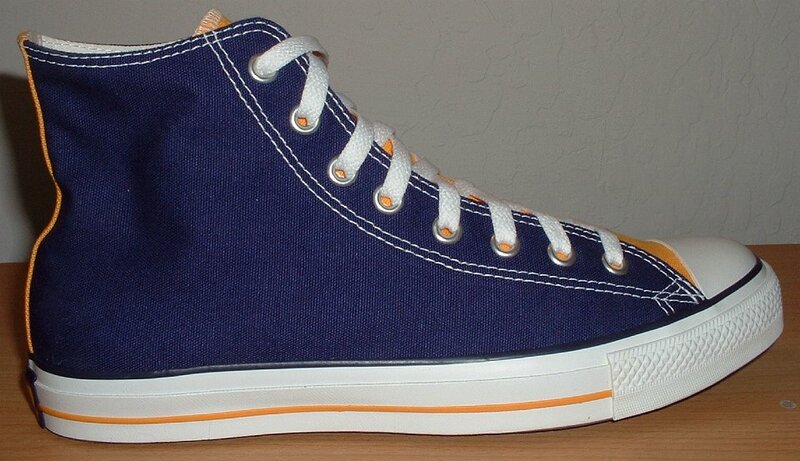 24 2-Tone Chucks New purple and gold 2-tone high top, left outside view. 25 2-Tone Chucks New purple and gold 2-tone high tops, rear view. 26 2-Tone Chucks New purple and gold 2-tone high tops, front view. 27 2-Tone Chucks Purple and gold 2 tone, outer sole view. 29 2-Tone Chucks New purple and gold high tops, inside patch and sole views. 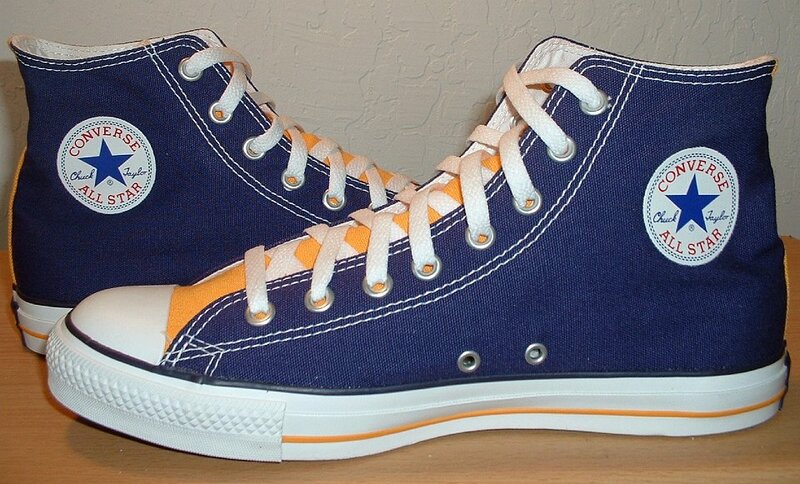 30 2-Tone Chucks New purple and gold 2-tone high tops, inside patch views. 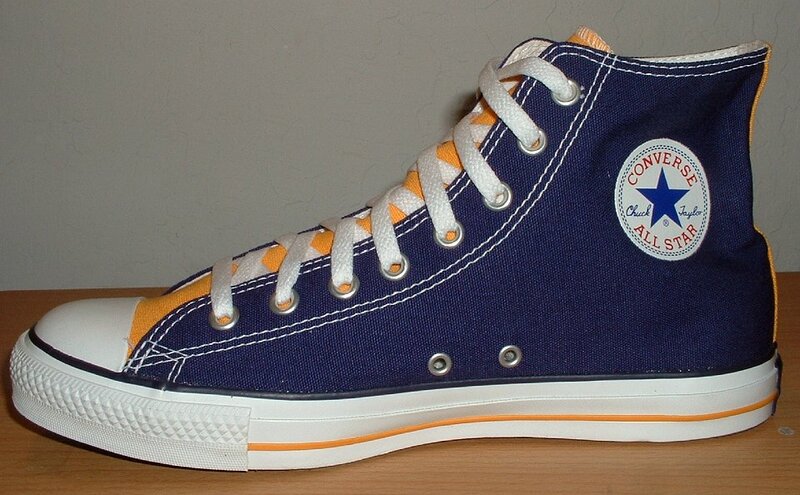 31 2-Tone Chucks Purple and gold low cut, right outside view. 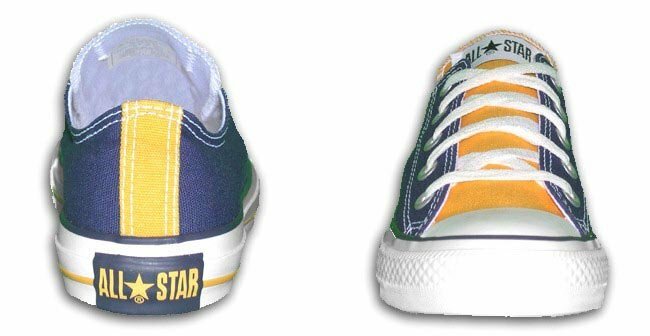 32 2-Tone Chucks Purple and gold 2 tone low cut, rear heel patch and front views. 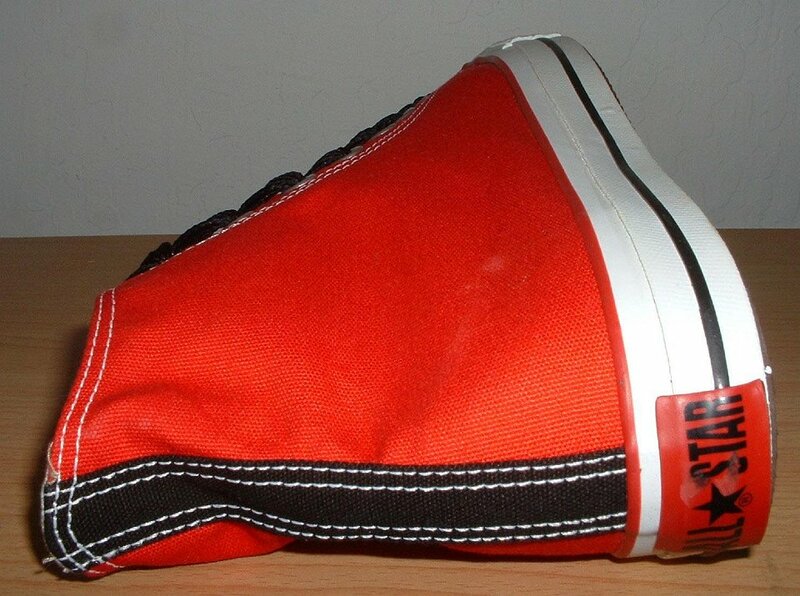 33 2-Tone Chucks Red and black right 2-tone high top, inside patch view. 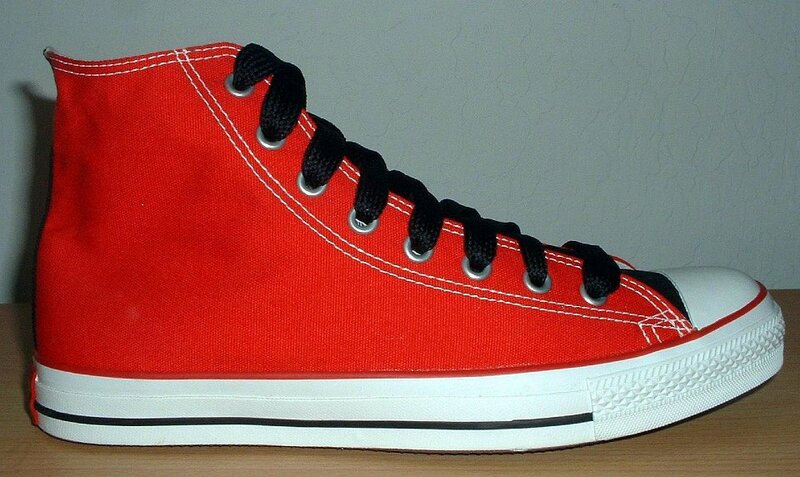 34 2-Tone Chucks Red and black right 2-tone high top, outside view. 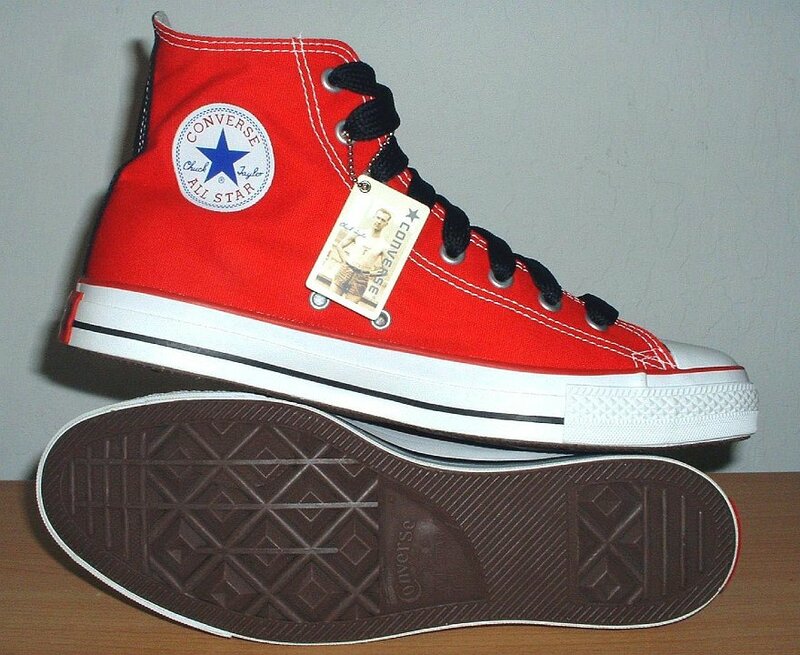 35 2-Tone Chucks Red and black left 2-tone high top, new with tag, inside patch view. 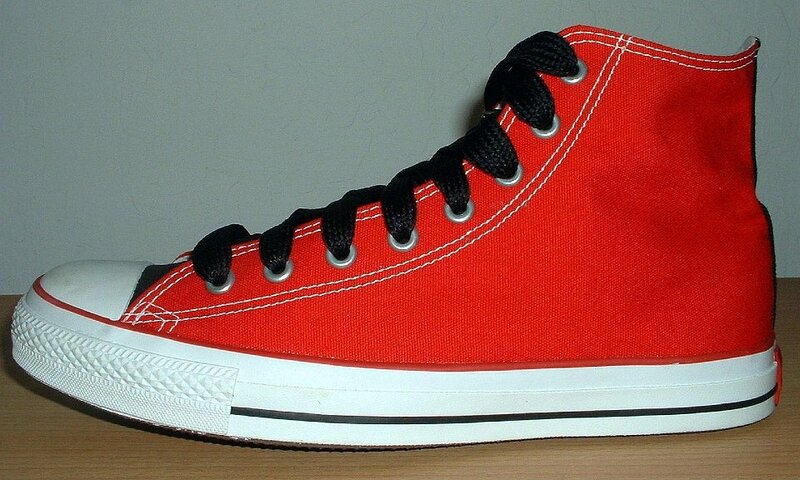 36 2-Tone Chucks Red and black left 2-tone high top, outside view. 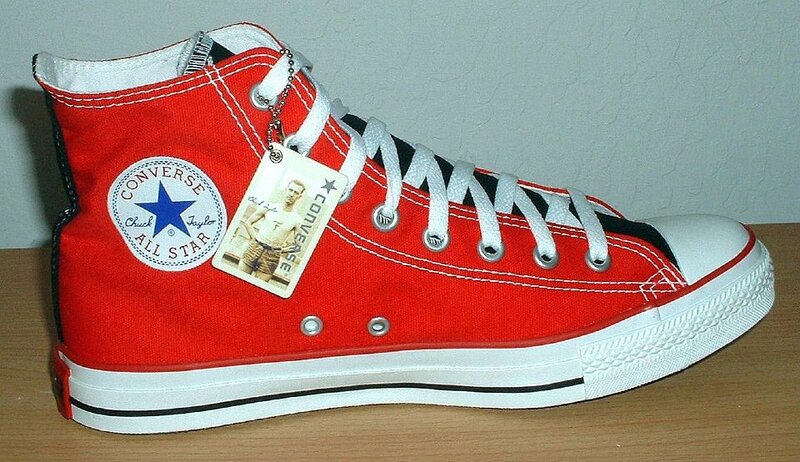 37 2-Tone Chucks Red and black 2-tone high tops, new with tag, inside patch view. 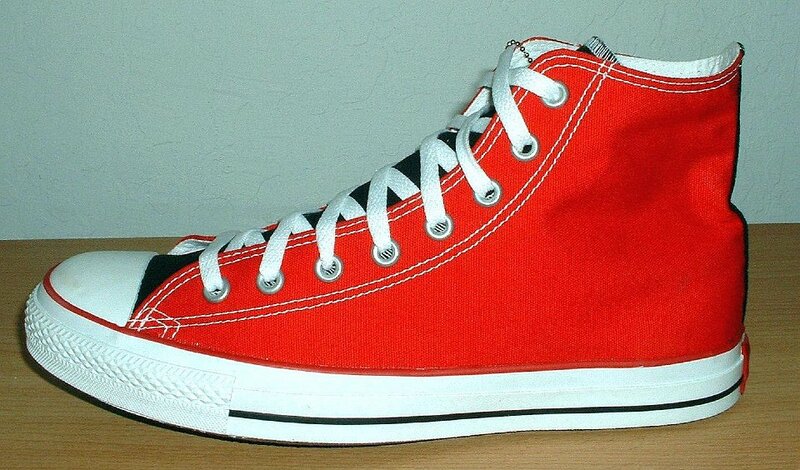 38 2-Tone Chucks Red and black 2-tone high tops, new with tag, front view. 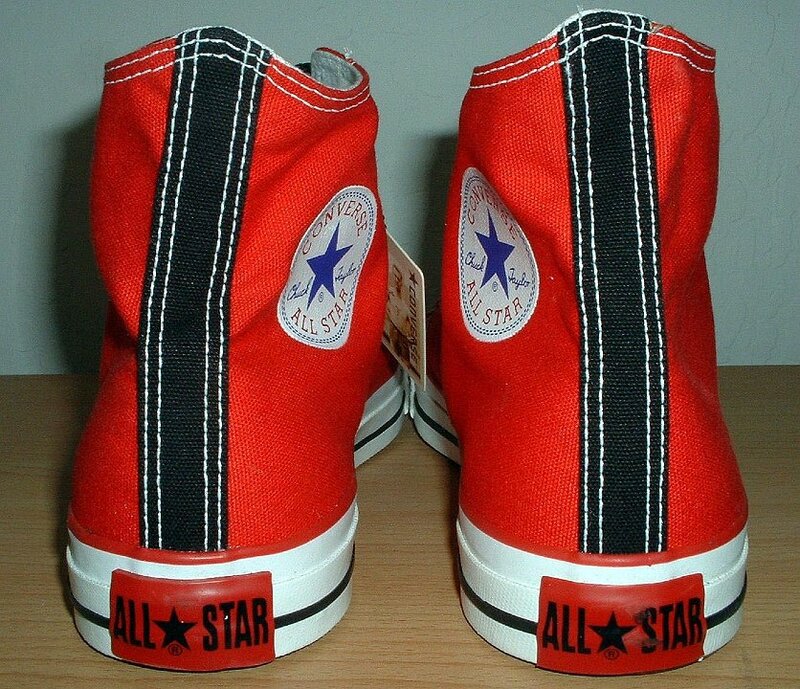 39 2-Tone Chucks Right red and black 2-tone high top, rear patch and outside view. 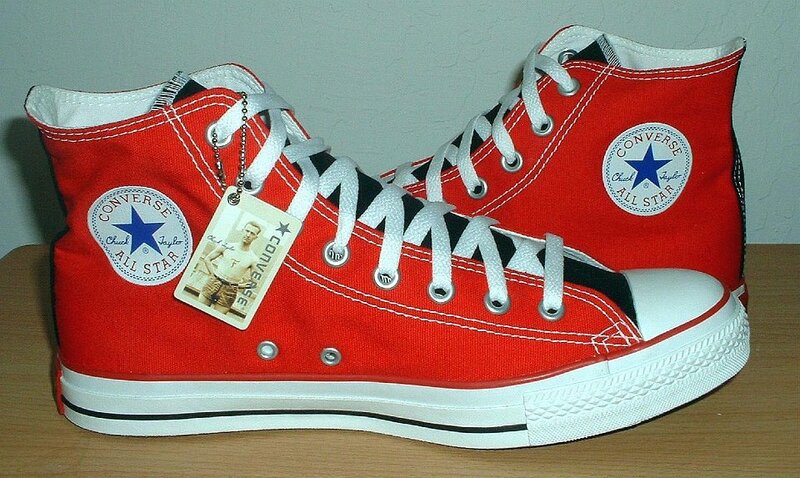 40 2-Tone Chucks Red and black 2 tone high tops, new with tag, top view. 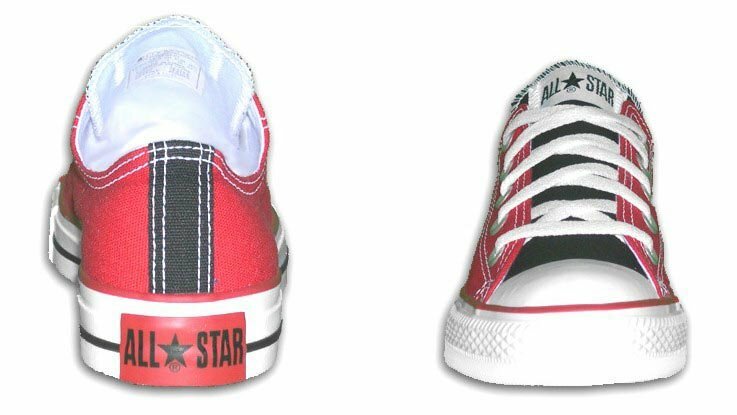 41 2-Tone Chucks Red and black right 2-tone high top, top and inside patch view. 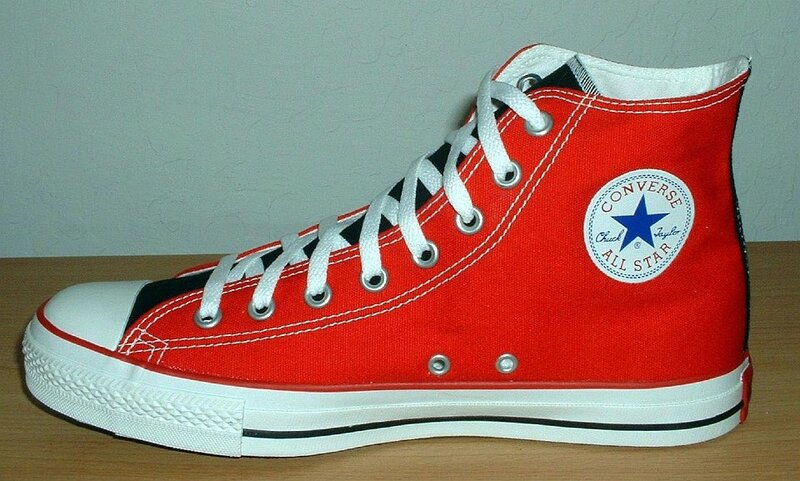 42 2-Tone Chucks Left red and black 2-tone high top, new with tag, sideways top view. 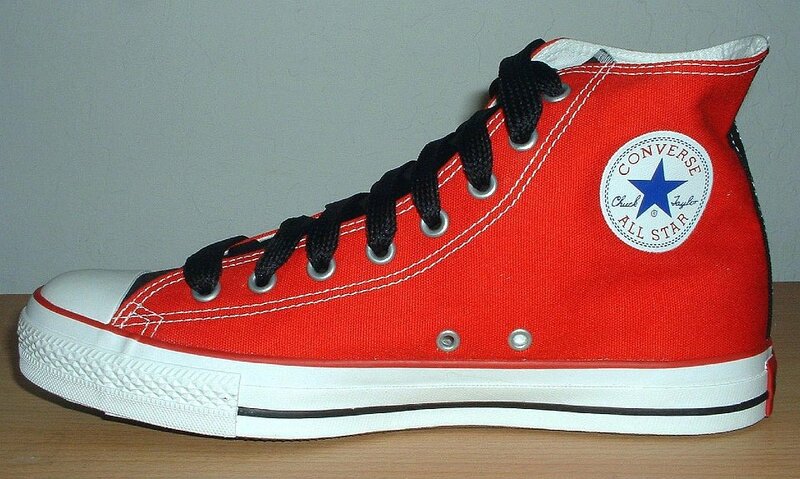 43 2-Tone Chucks Red and black right 2-tone high top with wide black laces, inside patch view. 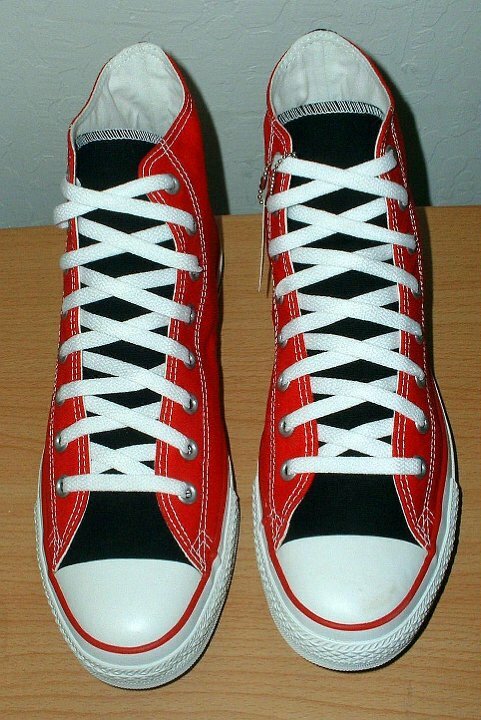 44 2-Tone Chucks Red and black 2-tone high tops, new with tag, rear view. 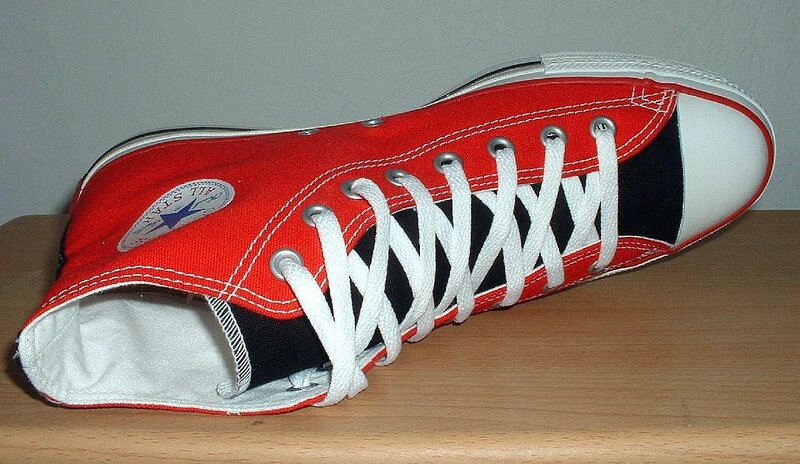 45 2-Tone Chucks Right red and black 2-tone high top with wide black laces, outside view. 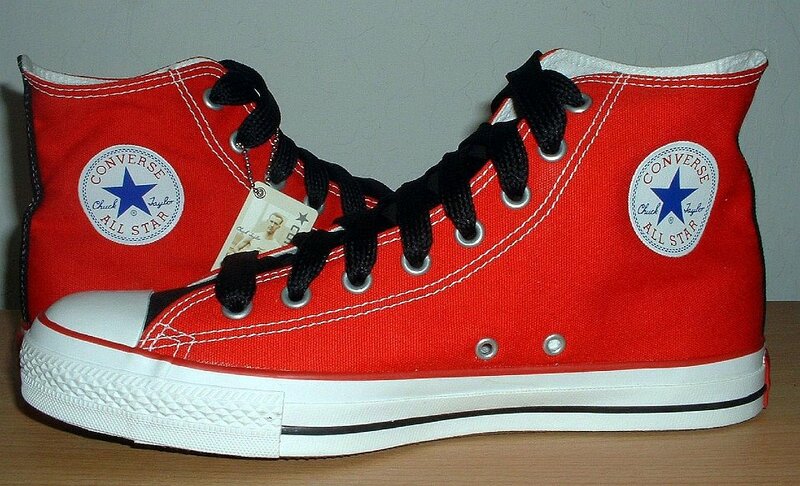 46 2-Tone Chucks Left red and black 2-tone high top, new with tag and wide black laces, inside patch view. 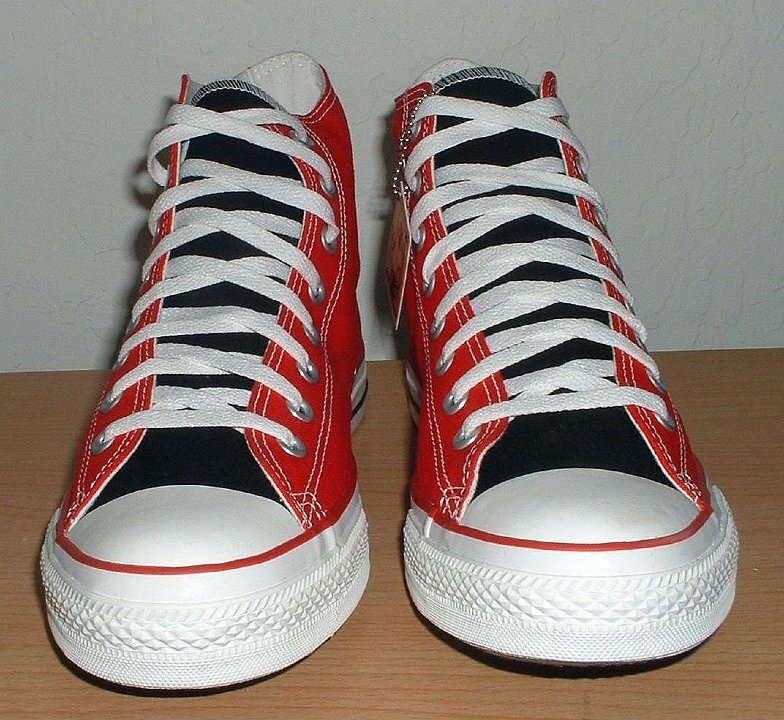 47 2-Tone Chucks Left red and black 2-tone high top with wide black laces, outside view. 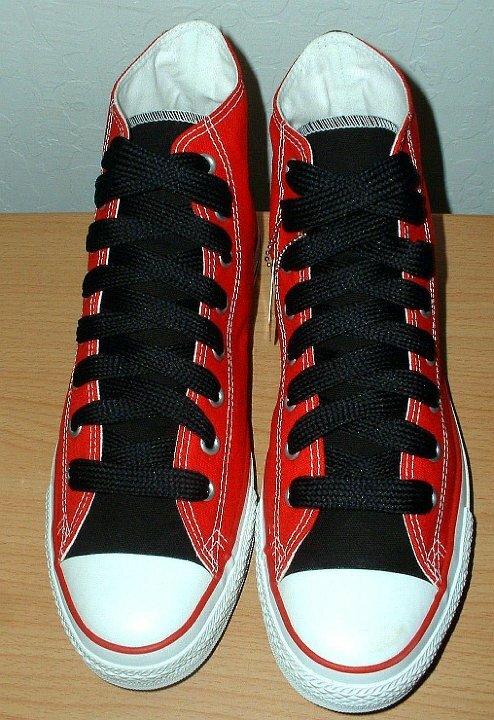 48 2-Tone Chucks Left red and black 2-tone high top, new with tag and wide black laces, sideways top view. 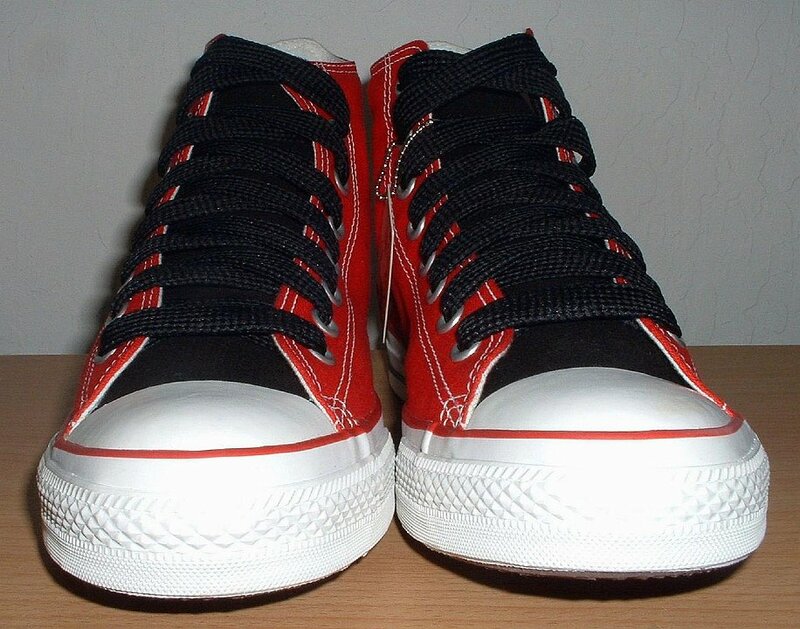 49 2-Tone Chucks Right red and black 2-tone high top with wide black lace, sideways top view. 50 2-Tone Chucks Red and black 2-tone high tops, new with tag and black wide laces, front view. 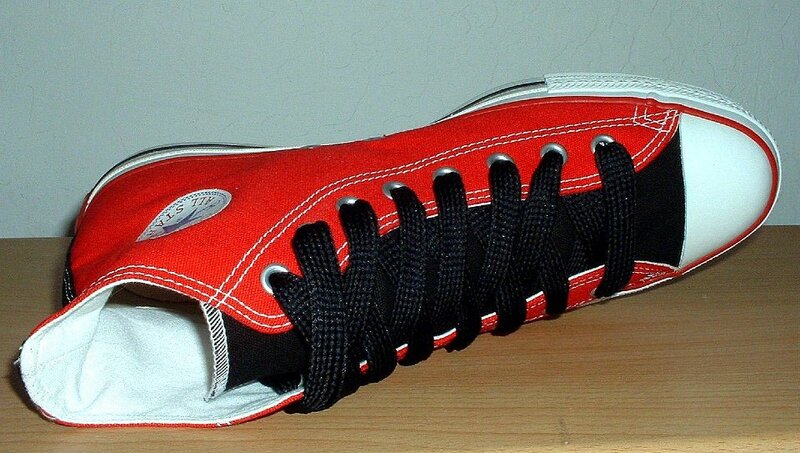 51 2-Tone Chucks Red and black 2-tone high tops, new with tag and wide black laces, top view. 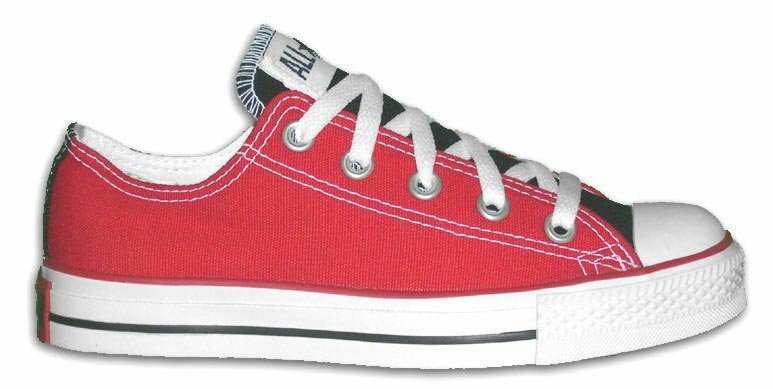 52 2-Tone Chucks Red and black 2-tone high tops with wide black laces, eyelet to eyelet side view. 53 2-Tone Chucks Red and black 2-tone high tops, new with tag and black wide laces, inside patch view. 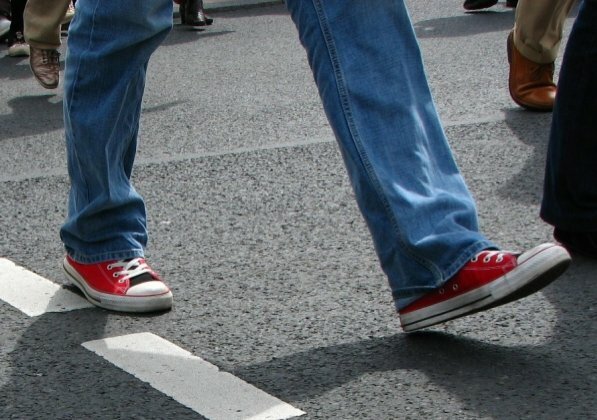 54 2-Tone Chucks Wearing black and red 2-Tone chucks. 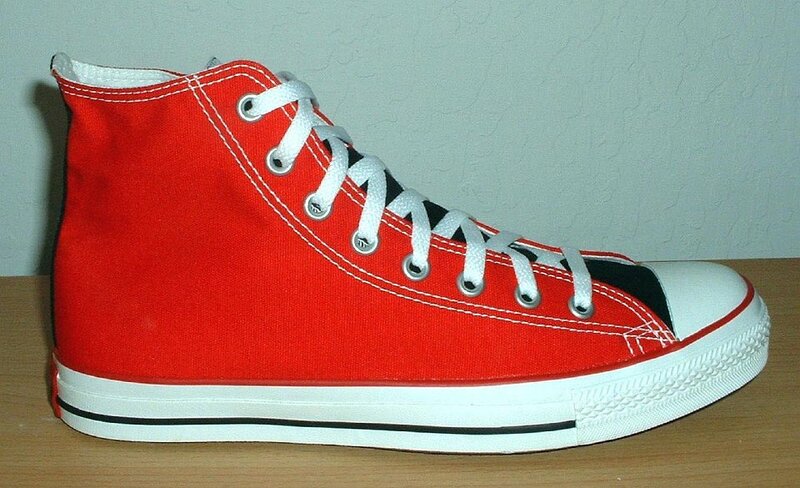 55 2-Tone Chucks Red and black 2-tone high tops, new with tag and wide black laces, inside patch and outsole views. 56 2-Tone Chucks Red and black 2 tone low cut, right outside view. 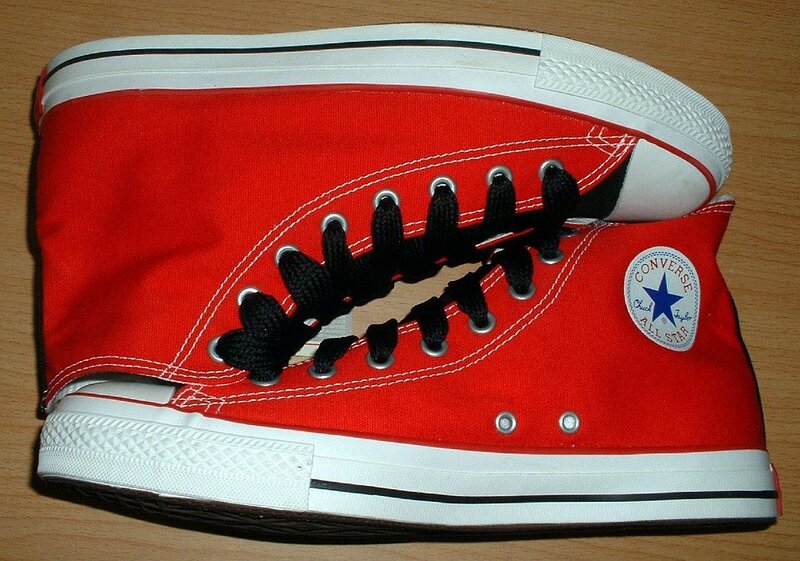 57 2-Tone Chucks Red and black 2 tone low cuts, rear heel patch and front views. 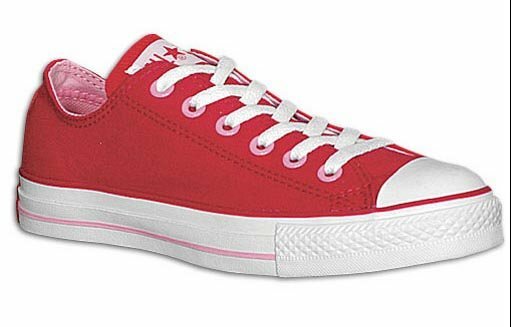 58 2-Tone Chucks Raspberry red and pink low cut, angled side view. 59 2-Tone Chucks Royal blue and orange 2 tone high top, left inside patch, front, and rear views. 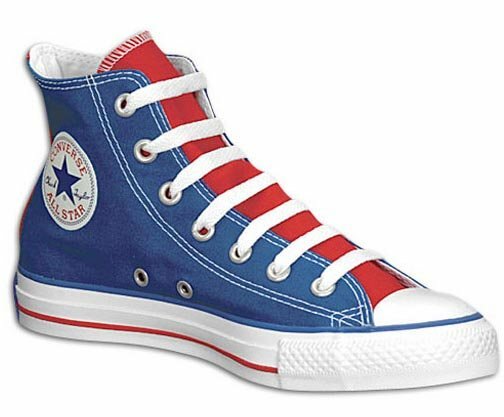 60 2-Tone Chucks Royal blue and red 2-tone high tops, side views. 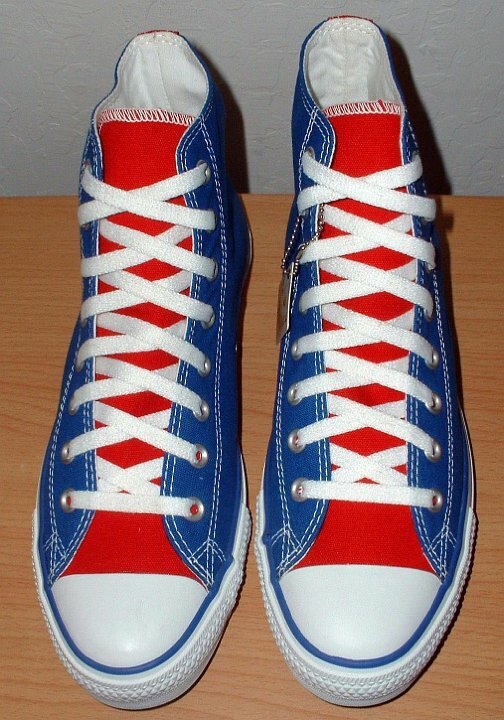 61 2-Tone Chucks Brand new unlaced royal blue and red 2 tone high tops, front view. 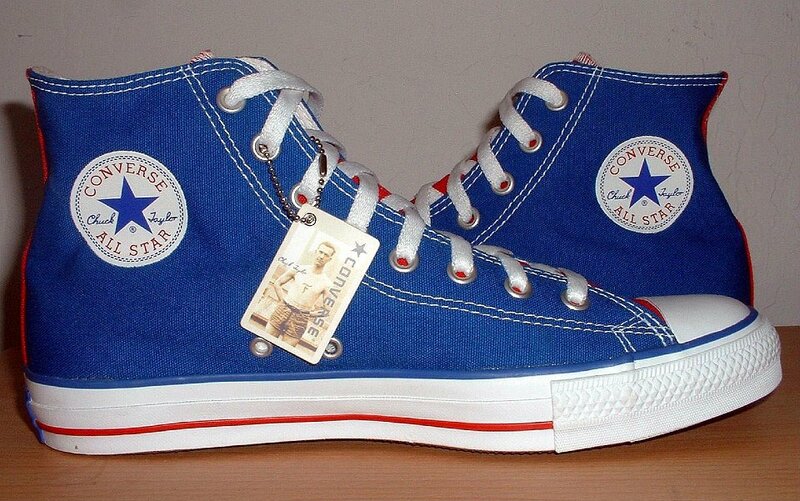 62 2-Tone Chucks Royal blue and red 2-tone high tops, new with tag, rear patch view. Note that this version has no red stripe in the rear and no red piping. 63 2-Tone Chucks Royal and red 2 tone high top, angled inside patch view. 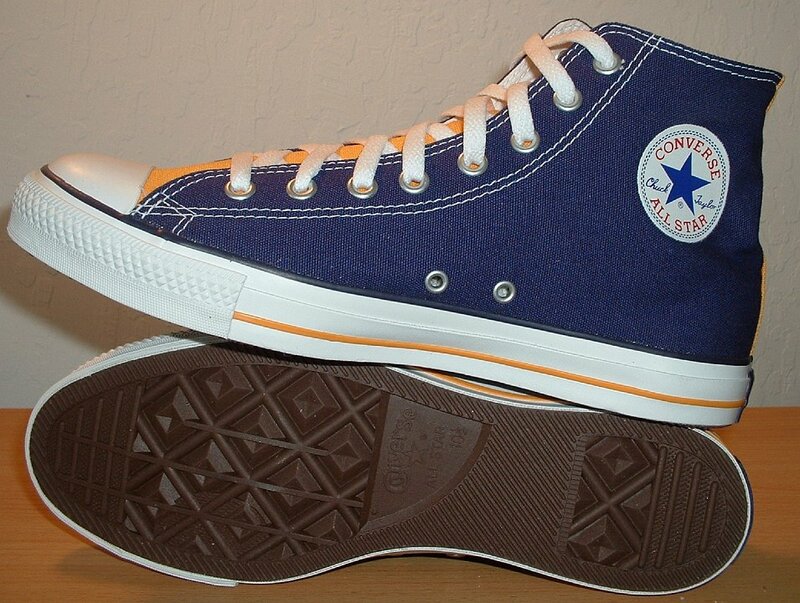 64 2-Tone Chucks Royal blue and red 2-tone high tops, new with tag, inside patch and outsole views. 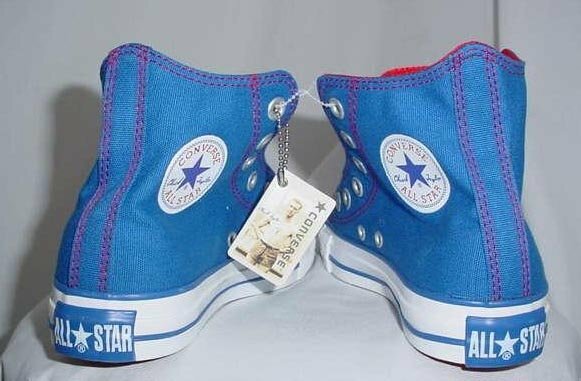 65 2-Tone Chucks Royal blue and red 2-tone high tops, new with tag, top view. 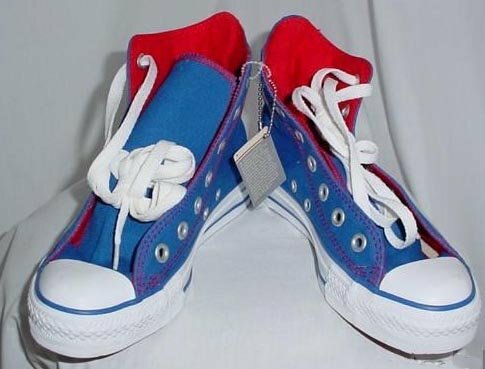 66 2-Tone Chucks Royal blue and red 2-tone high tops, new with tag, front view. 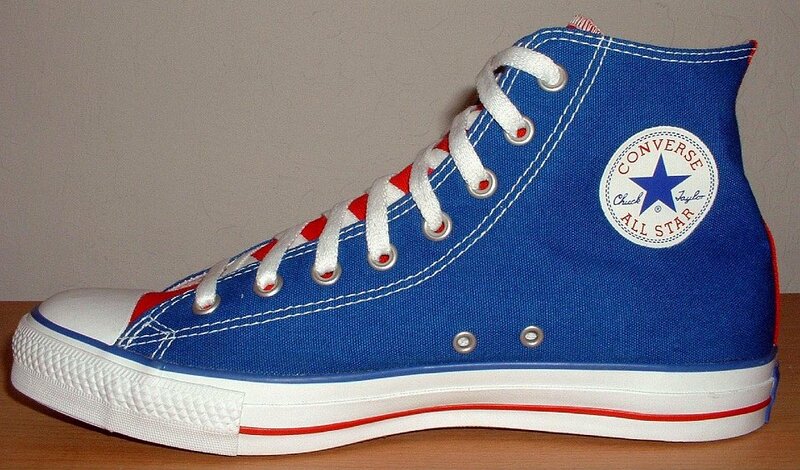 67 2-Tone Chucks Royal blue and red 2tone high tops, new with tag, rear patch view. 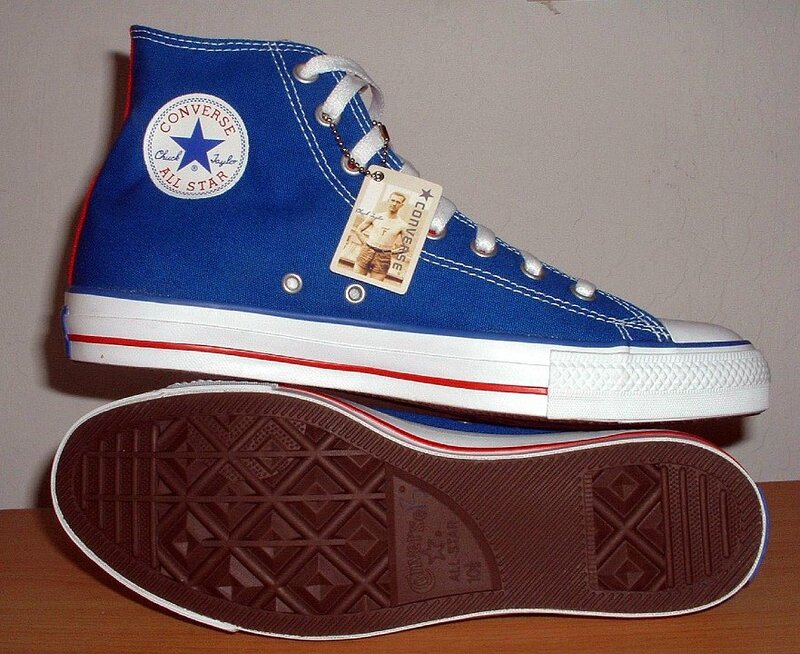 68 2-Tone Chucks Royal blue and red 2-tone high tops, new with tag, inside patch view. 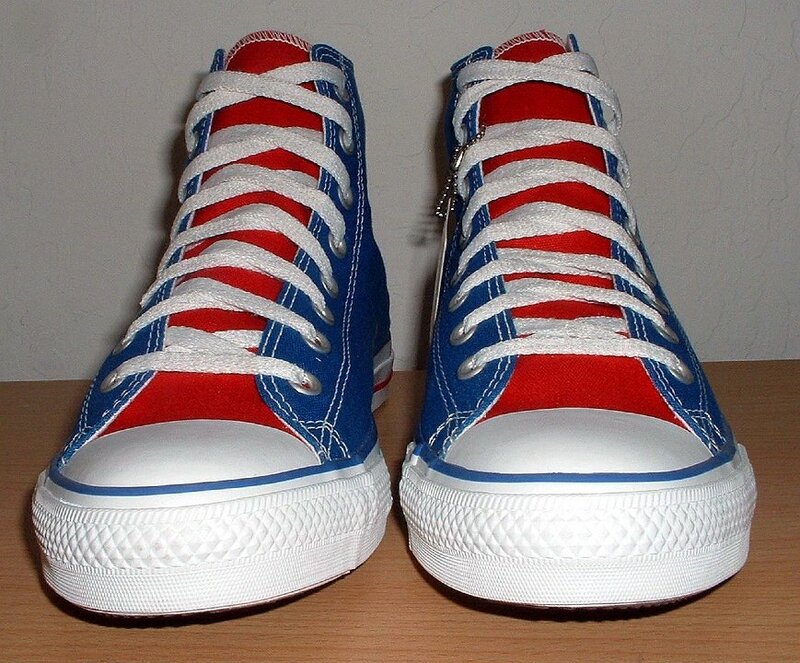 69 2-Tone Chucks Royal blue and red 2-tone high tops, outside view. 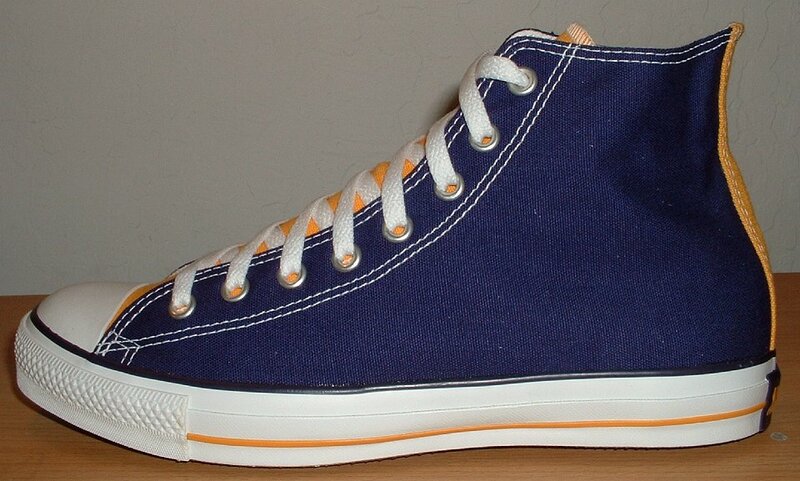 70 2-Tone Chucks Right royal blue and red 2-tone high top, inside patch view. 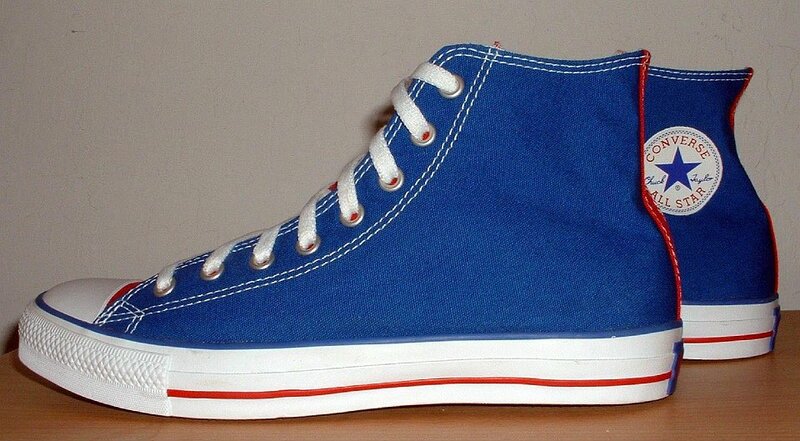 71 2-Tone Chucks Right royal blue and red high top, outside view. 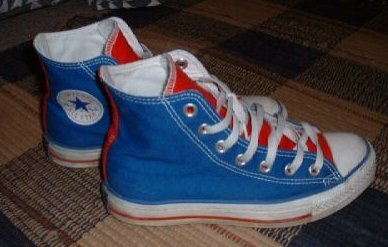 72 2-Tone Chucks Right royal blue and red 2-tone high top, sideways top view. 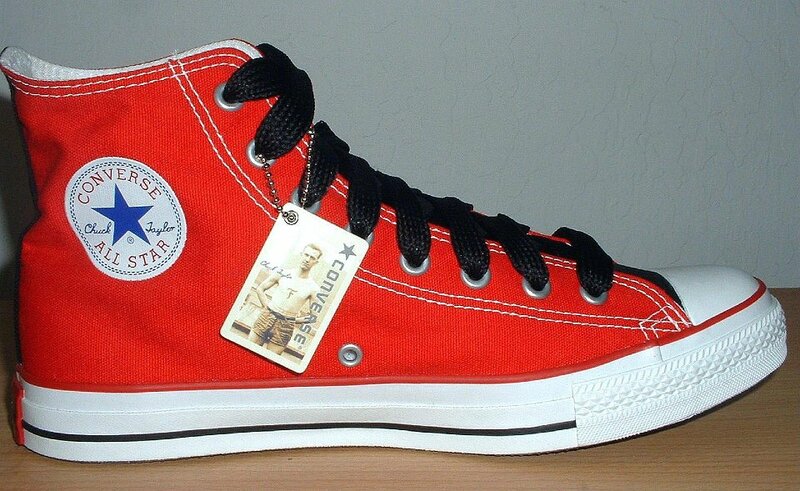 73 2-Tone Chucks Royal and red 2-tone left high top, new with tag, front and inside view. 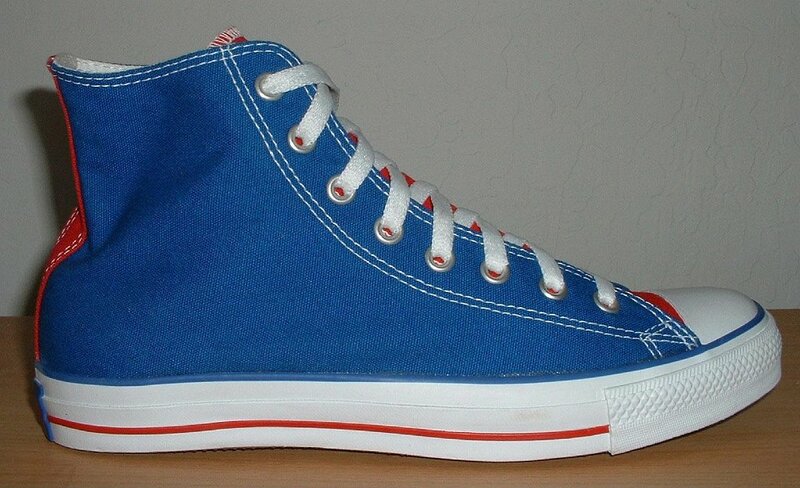 74 2-Tone Chucks Royal blue and red 2-tone high tops, side view. 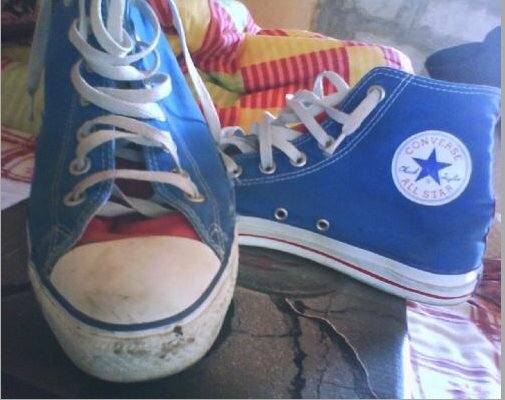 75 2-Tone Chucks Top and inside patch view of worn blue and red 2-tone high tops. 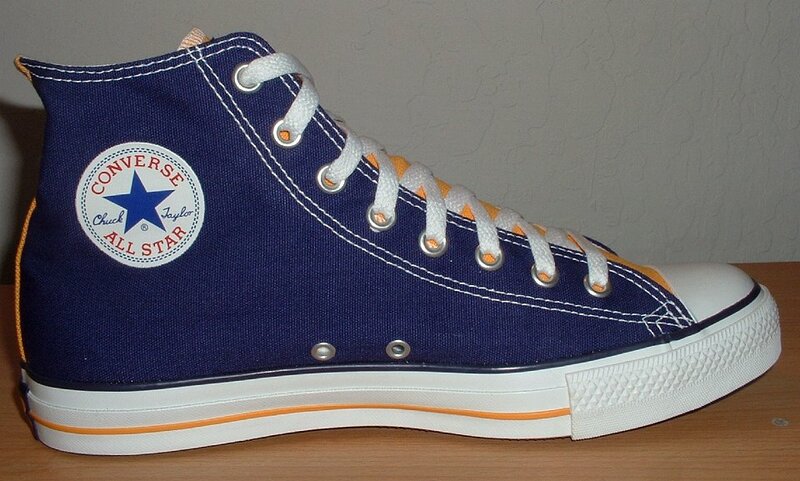 76 2-Tone Chucks Royal blue and red 2 tone low cut, right outside view. 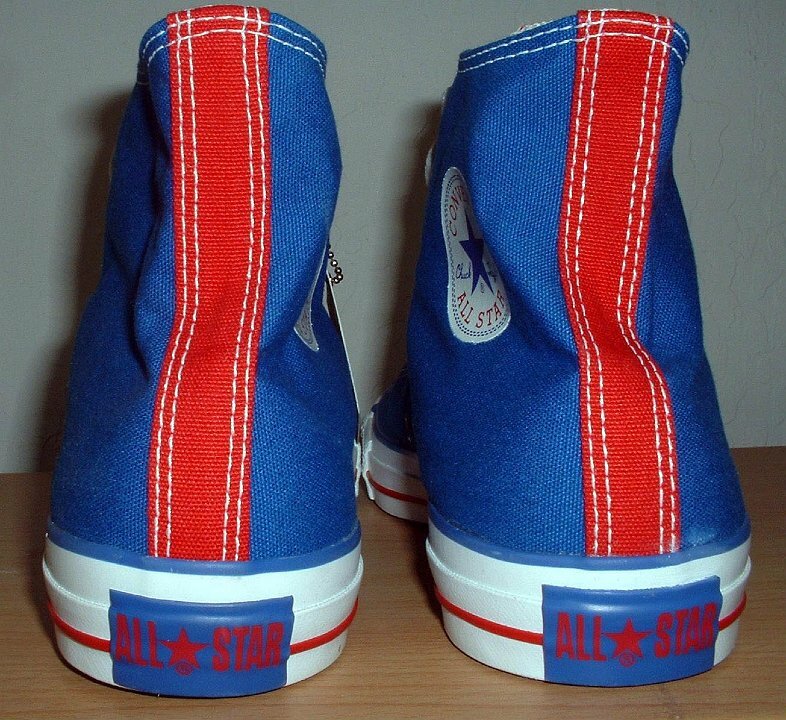 77 2-Tone Chucks Royal blue and red 2 tone low cuts, front and rear views. 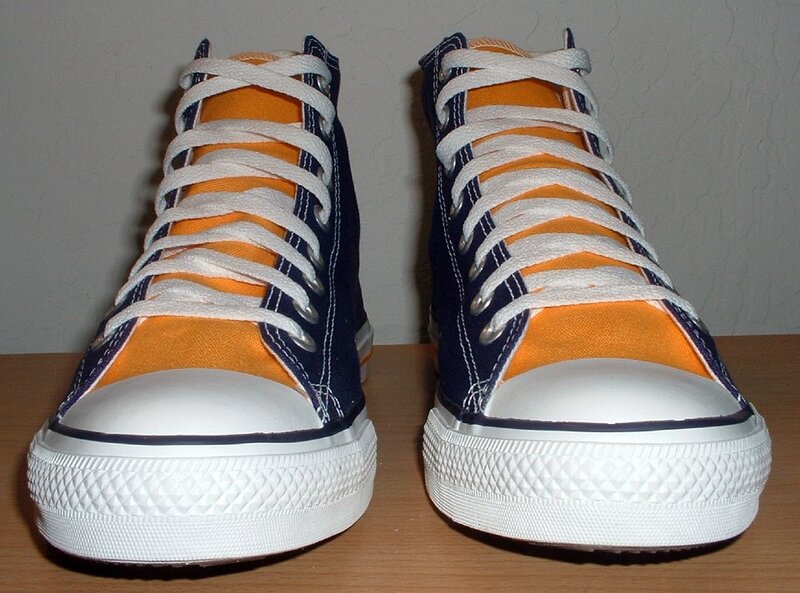 2-Tone Chucks first came out as a seasonal model in 2003. They use two colors of canvas for the uppers instead of one. 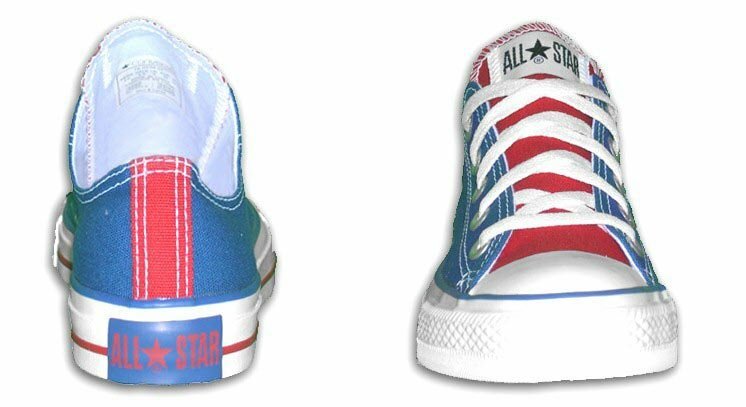 The main color is on the outsides of the shoe, and the second color is on the tongue, and heel support on the back of the shoe. 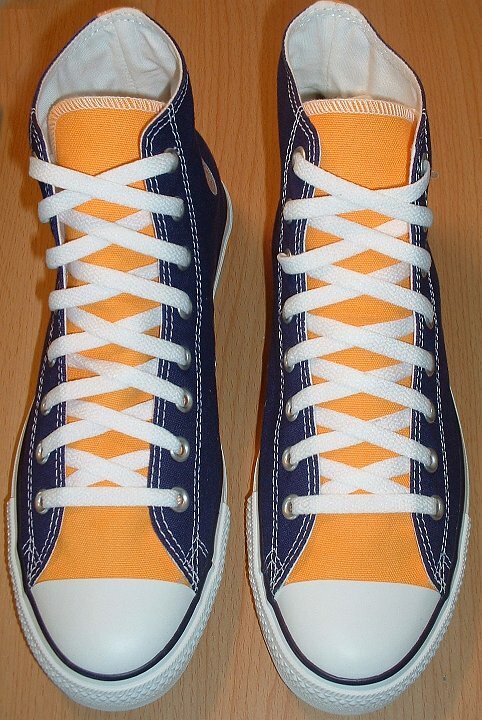 Piping on the shoes is usually two colors also.